Throughout his presidential campaign, Donald Trump repeatedly referred to the mainstream media as not only fake news, but a corrupt enterprise unto itself. Their actions during the campaign, and especially since Trump has taken office, prove he’s right. People certainly do get it. They’ve been keen to liberal bias in the media for many years now, and this past election season showed they were unwilling to let biased, inaccurate coverage change their views any longer. If you thought the industry as a whole would learn their lesson after being torn to shreds as corrupt, and worse ‘fake,’ you’d be wrong. 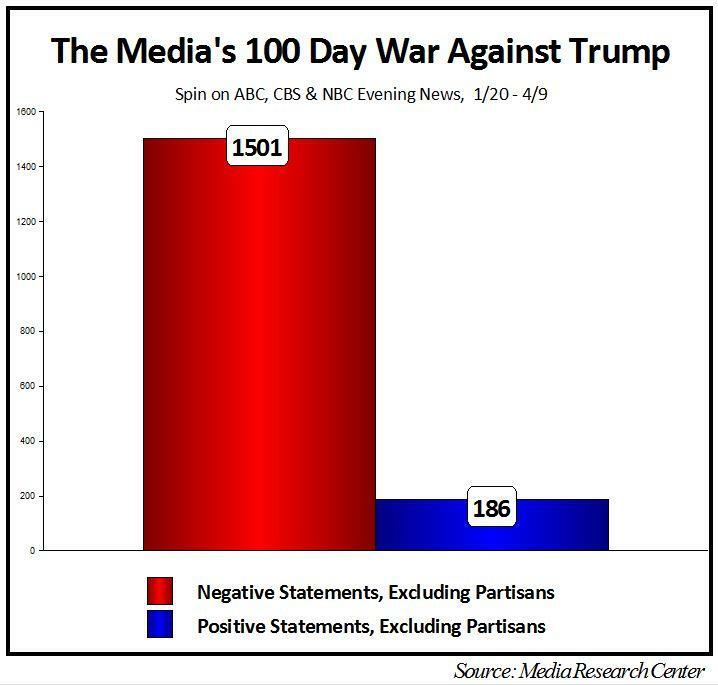 A new study from the media watchdog NewsBusters shows that mainstream outlets have been reporting negative news about President Trump at an alarming clip. Negative reporting on the President and his administration has reached nearly 90% of all coverage! By contrast, the Obama administration enjoyed an extensive honeymoon during the first 100 days of his presidency, with positive stories accounting for 58% of the network coverage. This despite having his own controversies and scandals – some of which Michelle Malkin covered in this column. The media was decidedly soft on Obama, and has been outrageously biased against Trump. We all knew the corruption was deep, but this study helps us better understand just how much the major news outlets loved former President Obama, and how much they despise President Trump. What ever happened to an impartial media? Whatever happened to fair and balanced? Do you think the media has been unfair to President Trump? Share your thoughts below.